The 2008 Lenape grade takes over as head coach for an Indians team with high expectations in 2018. 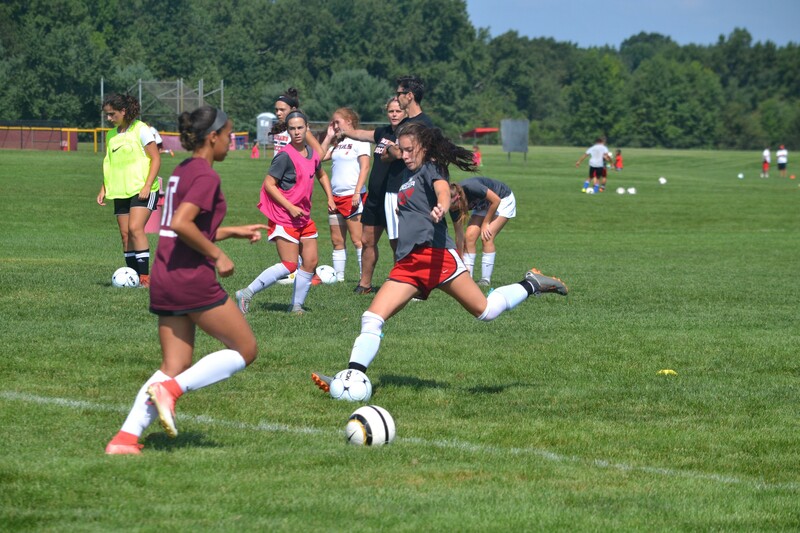 Lenape High School girls soccer completes a shooting drill during a preseason practice in August. The Indians are hoping for a winning season in 2018 under new head coach Jenn Pfeiffer. During the 2018 preseason, it was common to see Jen Pfeiffer take the field and get into the action during drills for Lenape High School girls soccer. It’s been more than a decade since Pfeiffer, a former all-conference player and 2008 Lenape graduate, last took the field for the Indians. However, Pfeiffer is now ready to lead Lenape in an entirely new role as the program’s varsity head coach. Pfeiffer has some big shoes to fill this year. She has taken over the job from Kevin Meder, who stepped down as head coach following the 2017 season. Meder was head coach for 13 years and guided the Indians to five consecutive Group IV state championships from 2007 through 2011. Pfeiffer had a strong relationship with Meder. She was on the first of those state championship teams in 2007 and went on to play Division I soccer at St. Joseph’s University. Pfeiffer returned to Lenape after college and served under Meder the past few seasons as the JV coach. Lenape will likely be one of the most experienced teams in South Jersey this season. Lenape’s roster consists of nearly all juniors and seniors, many of whom were starters during the Indians’ 8–11 season last year. With so many older players on the team, Pfeiffer is confident in the leadership skills of the team’s seven seniors. “We’re giving them a lot of ownership and a lot of accountability, and we’ll put in the work as coaches to help them out,” she said. Despite the high number of returning players, the Indians will be doing some things different this year, with one of the biggest changes being a new formation. A big focus of the preseason was strengthening the team’s chemistry. Pfeiffer described many of the team’s preseason activities as “competitively fun” to build stronger bonds between the players. Pfeiffer believes the key to the Indians’ success this season will depend on how well the players communicate. “With these guys, we’ve really been focusing on our communication that when we’re playing on the field, we have to be fit with our formation,” Pfeiffer said. There’s a hunger within Lenape’s upperclassmen in 2018. The Indians have a storied legacy, winning eight consecutive South Jersey Group IV championships from 2007 to 2014. However, the current crop of players was not part of those teams and they are prepared to add their own achievements to the history books.